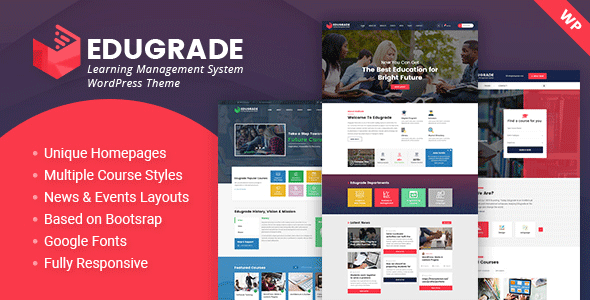 Edugrade Education WordPress Theme is beautifully and logically designed for all kind of educational institutions it can be used for univeristy, college and online courses websites. Edugrade is simple and user friendly Learning Management System(LMS) theme with LearnPress Plugin. Edugrade includes 2 unique homepages with multiple features like courses listing, events listings, instructors listings, contact form, mailchimp subscription and custom login register form. Event Management (Upcoming Event, Event Schedule, Event Speaker and Event Single page).